"This scheme is in operation since October 1 this year," WFP Programme Assistant Ms. Rebecca Miranda, who is in charge of the Nutrition Programme in the northeast, said while addressing the WFP day event held Thursday at Trincomalee Divisional Secretariat. She further said for the first six months the government supplies dry rations to resettled displaced families. For the other six months, the WFP has come forward to assist these families by supplying their food materials in the name of " Food Basket." " This is to make them not to worry about their food for about a year till that time they could find financial support on their own," said Ms Rebecca Miranda. WFP's goal is to build the capacity of the resettled displaced families to make them stand on their feet without others help, said Ms Rebecca Miranda. WFP implements three projects in the northeast. One is Food for Work. Under this WFP supplies food materials to the people of the area who participate in tank renovation and other agricultural development works. The second is Food for Education. Under this WFP supplies mid-day meals to children to overcome malnutrition and to make them bright in their studies. WFP now supplies mid-day meals to more than 28 thousand students in 128 schools. The third is Mother-Child Nutritious Project. Beneficiaries of the project are about eighty thousand. This is to create awareness among mothers about their health and children's, said Ms Rebecca Miranda. Trincomalee Divisional Secretary Mr.S.Arumainayakam who presided over the event inaugurated the distribution of kerosene cookers and cooking utensils to the heads of the 29 families whom returned to Trincomalee last month after staying Tamilnadu refugees for about thirteen years. 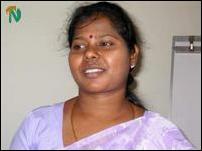 However their families are still living in Nagapatinam refugee camp in Tamilnadu, sources said. Divisional Secretaries of Kuchchaveli, Thampalakamam and Morawewa participated in the WFP day event. 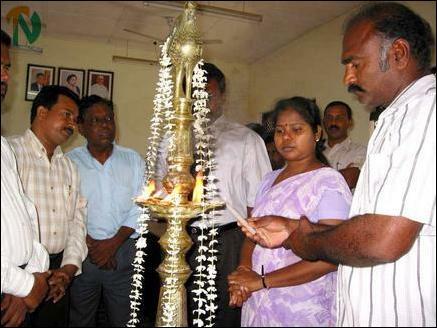 A Trincomalee returnee, who returned after thirteen years in a refugee camp in Tamilnadu, India, lights the traditional oil lamp at WFP day held in Trincomalee Ms. Rebecca Miranda is seen to his left.